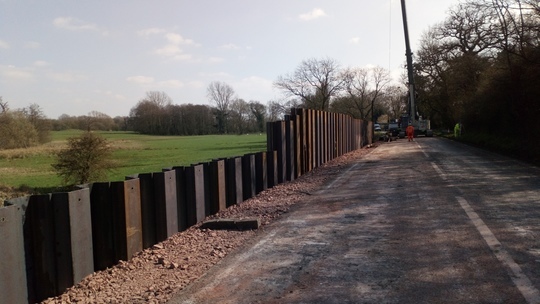 Over the first two weeks, the main work has been to place steel pilling sheets next to the river bank alongside the southbound carriageway. These sheets were driven into the ground to form a retaining wall which will help to secure the riverbank against erosion of the road. What other work has been done? While the work on the southbound carriageway was being carried out, the contractors have also been hard at work on the northbound carriageway installing new crash barriers. With the completion of the crash barriers on the northbound carriageway, the landscaping and street cleaning teams will begin their work on the road. What work is going to be done next? Completion of the retaining wall is expected early next week. At which point the carriageway behind will be excavated and re-surfaced as it has been damaged through movement of the ground adjacent to the road. Remedial works at Molands River Bridge have now started. We’ll keep you posted with any further updates from Solihul MBC as and when we receive them.